Important Notice: Lithium-Ion Item - Express Delivery option not available due to transportation regulations.Milwaukee's new M12 600 MCM Cable Cutter delivers jaw dropping cable cutting power in a compact and portable package. Using a break through powered ratcheting mechanism and superior blade geometry, the M12 Cable Cutter cuts through large and small cables with ease, leaving a clean installation ready cut. Its compact size and scissor style jaws enable cutting in crowded panels without looping, ratcheting or long arms, freeing up precious space needed. Suitable for electricians and technicians of all types, Milwaukee's M12 600 MCM Cable Cutter delivers reliable performance. Powerful jaws cut effortlessly through large cables. This one tool saves more time and mussels then you can only imagine! This tool takes the struggle out of cutting large conductors and cables. It's great or us old guys who are worn out and great for young guys so that they don't wear out. 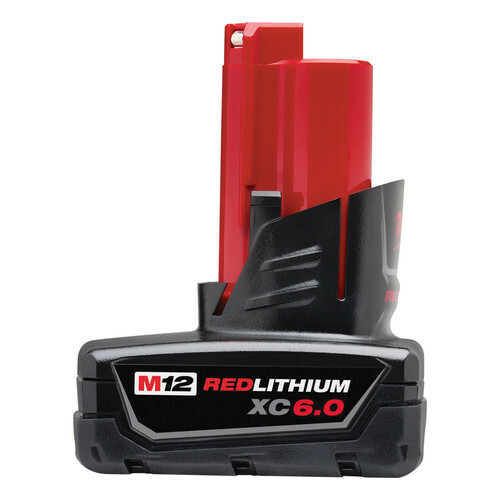 Another great addition to the 12 volt family of tools. Wish I had bought one years ago ! Well designed. Thank you Milwaukee. have used it a few times and I'm already impressed by how fast it cuts. have recommended this to other electricians. Makes cutting entrance cable a snap. cutter fits right into the meter socket if you need to nip a little more wire off. Only small issue is that all the weight is to the front of the handle so the balance is a little off for one handed use. This product rocks cuts through all wire with ease. the two speeds are great for small copper or aluminum wire (fast) and big copper such as 500 mcm (slow). the one hand operation makes cutting in panels a breeze. this tool's battery life is better than our company's 18v. cutter. Im a logger an cut 3/4 inch and sometimes bigger cable.winch cable is a lot harder then normal cable will this handle cuting that?? torch. This product is not meant for steel!!! You might be able to purchase steel rated blades ? No, Iike you said winch cable is harder so having used this tool a few times I don't see it cutting that type of cable. This item may not be suitable for your needs. Will this cut 1/2 inch copper tubing? BEST ANSWER: Yes I have cut copper tubing with it but only for demolition. I will not leave a pretty cut for soldering or shark bite. Can this cut 4" rope? Will this tool cut 3/32” steel banding wire? I want to use this to cut through Metal springs found in mattresses. Will this cut through them?